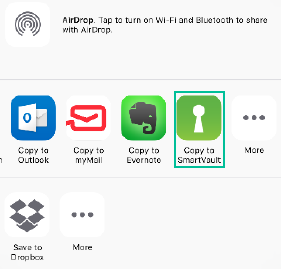 You can upload documents to SmartVault using a third party file sharing app on iOS. Note: The files that you are uploading to SmartVault must be in a third party file sharing application such as email, DropBox, or Google Drive. SmartVault does not support third party apps. 1. On your iOS device, open your preferred third party file sharing application. 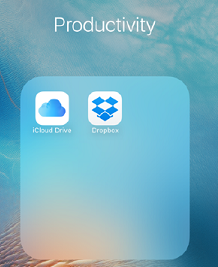 Note: The example below uses Dropbox on an iPhone. Your third party app will not have the exact same steps. 2. Locate the document you want to upload. 3. Preview the document by tapping the document title. 4. 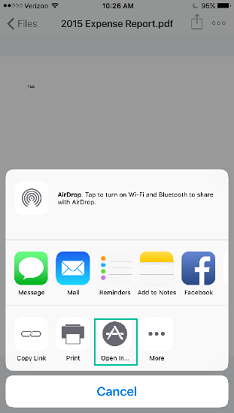 Select the document and then tap the share icon (a box with an arrow pointing up). 6. Tap Copy to SmartVault. 7. 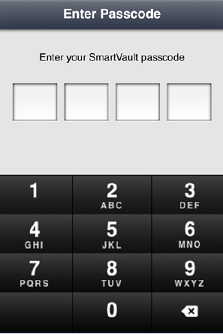 Enter your passcode and choose the SmartVault folder to which you want to upload the file. 8. Tap Upload on the top right of the app. Your file is uploaded to SmartVault.